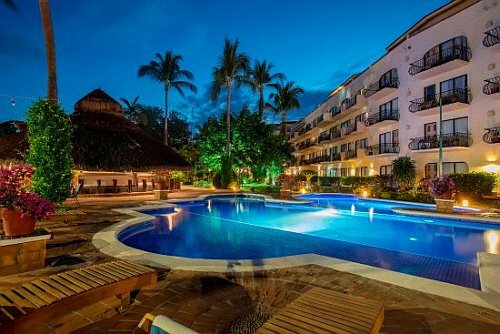 Sunwing Vacations has dropped the price of a 7-night flight and hotel package from Vancouver to the Flamingo Vallarta Hotel And Marina in Puerto Vallarta, Mexico down to $455 CAD including taxes. It's not an all inclusive package with food and drinks included. Just the flight, hotel, and transfers to/from the airport. 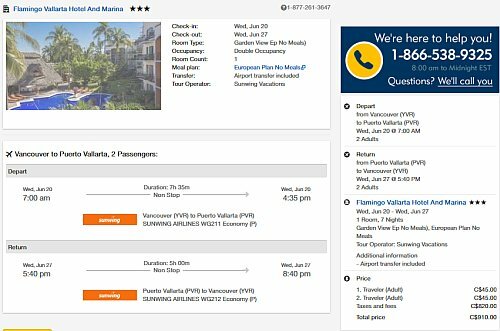 It's still a pretty great price though, considering a flight from Vancouver to Puerto Vallarta generally goes for a minimum of $450 CAD roundtrip alone. You are essentially getting the hotel thrown in for free. The Flamingo Vallarta has 4 circles on Tripadvisor with 39% of reviews rating it as excellent. The Sunwing flights from Vancouver to Puerto Vallarta have 1 stop on the way down (2 hours) and are non-stop coming home. 2. Click on the 'All Inclusive Vacations' tab (even though this is not really an all inclusive package, just the flight and hotel). NOTE: Once you get to the search results page, use the 'Search by hotel name' pulldown menu and select the 'Flamingo Vallarta Hotel And Marina'. vancouver, yvr, mexico, flight and hotel packages, puerto vallarta, pvr, north america, sunwing vacations and Flamingo Vallarta Hotel And Marina.